A contributor reported yesterday that they'd heard someone referring to literary scholars as 'literarians'. I know the word only as a term for people who are wildly enthusiastic about reading literary texts, as is presumably the intention with this blog title. (And if you click there, be sure to check out the peevology on unfriend as the Oxford UP WOTY.) That kind of love of reading is a trait that tragically few professors of literature seem to share. The exceptions are a joy, though. 1866 F. HALL in Reader 24 Feb. 206/2 Passing to his compatriot Sanskritists, we come upon a brood of literarians. Nice. A brood of literarians. I like that a lot — and am curious about the context. Speaking of peevology, I've been horribly remiss in not calling attention to Jan Freeman's new blog, Throw Grammar from the Train. * It is — do I even need to say this? — great. We've got a review of recent book, Ambrose Bierce's 'Write it Right' coming. *I was reminded of this on a visit to Wishydig. 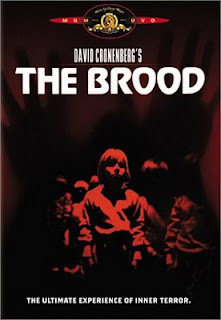 "A brood of literarians" is a lovely phrase, complicated now by association with Cronenberg's excellent but deeply creepy film. I am imagining an old-school prescriptivist suddenly finding it absolutely necessary to split an infinitive, and feeling "the ultimate experience of inner terror". Throw Grammar from the Train is great, as you say — and funny, like its title. Yup, splitting infinitives can be more terrifying than splitting skulls. Or something.